tldr& Killer DD Elvaan with 4 emps, Killer Warrior rquiped with all the goodies including Phrocy gear. 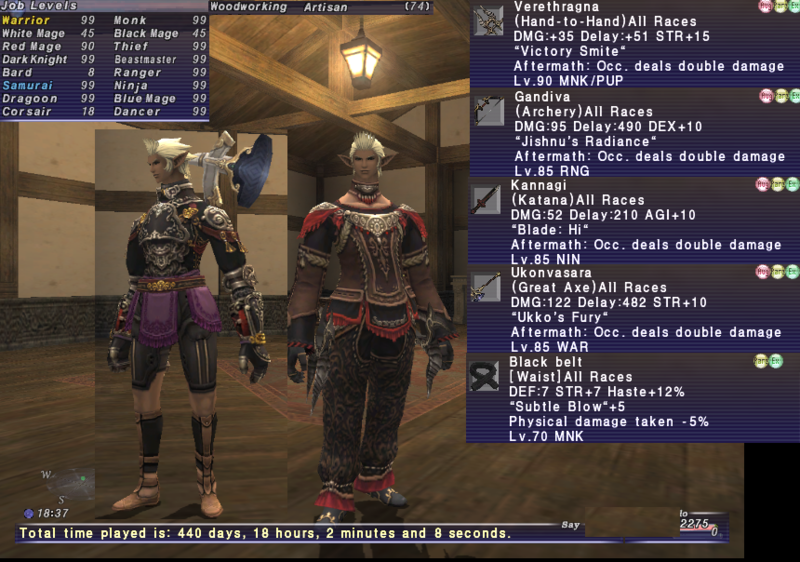 Monk is the top geared job, black belt, Vere, Thaumas af3+2, af2+2, THF fully geared out with capped TH. DD Atmacites @ level 15! This is a killer DD Elvaan, 2nd POL ID on this account with a Taru Male mage with Mage jobs (WHM/BLM/THF/BRD/RDM/BST/SMN)af3+2 etc, full Abyssya,VW access, 91 cooking! Perfect Combo pack!